Find homes in Millstone for sale. 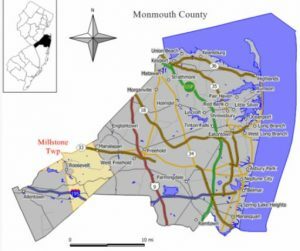 Rural Millstone is located in the southwest sector of Monmouth County. Millstone borders upon towns in Ocean, Middlesex and Mercer counties. The population, according to the 2010 Census was 10,566. The population has probably grown since then. The median household income at that time was $134,909. The homes in Millstone are detached single family homes. There are no condo complexes in Millstone. public utilities, such as city water and sewer, are not available. Due to the large lot sizes in most sections of town, many of the homes are small farms and horse farms. Millstone Township does not have it’s own police department, in fact, the New Jersey State Police patrol the town. However, there is a volunteer first aid squad. The township has an area of over 37 square miles. Millstone has a number of parks in town. The parks offer the usual playgrounds, ball fields and also trails for hiking, horse riding and more to people living in Millstone homes.. Shopping is available nearby on Route 9 or Route 130. Students in pre-kindergarten through eighth grade are educated by the Millstone Township Schools. As of the 2014-15 school year, the three schools in the district had a student population of 1,909 students. And there were 921 classroom teachers. When students from Millstone homes continue into high school they will attend Allentown High School. This school also includes students from Upper Freehold and Allentown. As an option, when students are about to enter high school they have the option to attend the Monmouth County Vocational High School District. Additionally, there are part time courses offered in many health fields and culinary arts, with the construction trades and automotive fields as well. The district also has seven full time magnet schools. These schools provide career education in communications, health care, high technology and more. In addition, there are private schools in the area. Call 732-598-7700 today to see Millstone homes for sale or Millstone homes.